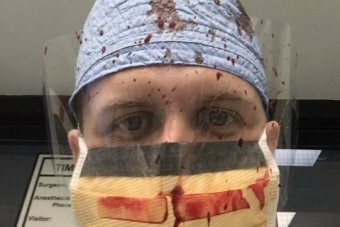 US doctors are sharing haunting pictures of the aftermath of gun violence on social media after the National Rifle Association of America (NRA) told medical experts to “stay in their lane” when it comes to firearms restrictions. “Someone should tell self-important anti-gun doctors to stay in their lane,” the tweet read. “Half of the articles in Annals of Internal Medicine are pushing for gun control. Dr Judy Melinek responds to NRA comments that doctors should “stay in their lane” rather than comment on gun violence. Tweet from Stephanie Bonne: Hey @NRA ! Wanna see my lane? Here’s the chair I sit in when I tell parents their kids are dead. How dare you tell me I can’t research evidence based solutions. “As scientists and caregivers, we doctors are in a unique position to understand the scale of human suffering caused by guns,” she wrote. “We have to do something.